Smoothies don’t always have to be packed to the hilt with kale and spirulina. Sometimes there’s nothing better than a refreshing fruity concoction as a summer evening treat, and that’s exactly what we have here. 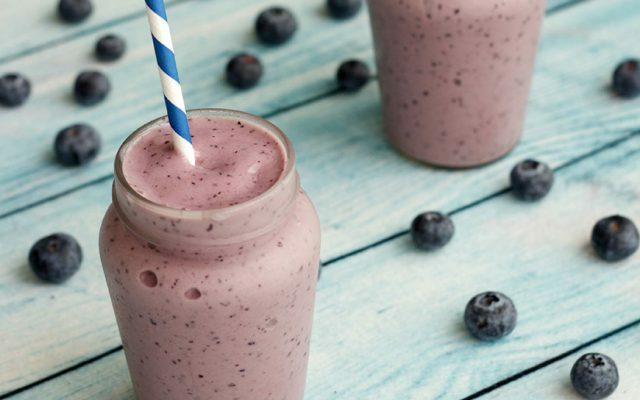 This simple blueberry smoothie, while still full of beneficial nutrients and antioxidants, could definitely pass as a dessert in our book. That’s not to say that you couldn’t use this smoothie as, say, a powerful breakfast meal. Blueberries, despite how naturally tasty they are, might be one of the healthiest foods for us. Their unique combination of vitamins and antioxidants easily classifies them as a “superfood.” From Vitamin K (which many of us don’t get enough of) to the powerful gallic acid (proven to fight inflammation, cell degeneration, and even cancer), blueberries manage to pack quite the punch in such a little fruit. Bananas and peaches, the other components of this yummy creation, are also packed with vitamins and minerals, making this a simple yet effective energy booster, immune supporter, and of course, a belly pleaser. Mix all of the ingredients together in blender until creamy. Serves 2. There’s a lot of fancy scientific terms floating around these days when it comes to what we should and should not be putting in our bodies, and it can admittedly be a chore to research what it all means and how it directly or indirectly affects what you should be eating. There’s an easy solution to this, and that’s to try and picture whether or not the food in question would have been something our ancient ancestors would have eaten in their natural habitat. If you think about antioxidant-rich foods, they mostly encompass finger-food, like berries and other small fruits, as well as some nuts, such as pecans. Antioxidants aren’t just some bizarre “miracle” chemical present in a specific handful of weird foods that just happen to heal our bodies. Antioxidants are supposed to be a staple in our natural diets. Our bodies absolutely need antioxidants to function correctly – we evolved having to rely on them for thousands of years. So obviously, fruits like blueberries, despite earning the tagline of “superfood,” should just be thought of as a dietary staple. This is the kind of thing we should be eating on a regular basis, it’s what we were meant to be chowing down on. So what better way to start incorporating more of these essential antioxidants in your diet than with blueberries? Tell us what you think about our smoothie in the comment section below, and let us know if there’s a certain kind of smoothie you’d like to see us conjure up.